The 2016 MINI John Cooper Works Concept was first revealed at this year’s North American International Auto Show in Detroit. The newest JCW proved to be quicker and more powerful than any model before it. The MINI John Cooper Works revealed in Detroit featured larger air inlets, an updated front grille, a new diffuser, and a new, more powerful four cylinder. As it turns out, the 2016 JCW is the most powerful MINI ever produced. New spy shots released by TopSpeed suggest that a 2016 JCW convertible version is well on its way to production. Presumably in the testing phase, a camouflaged 2016 MINI John Cooper Works Convertible has been spotted out and about. The performance-oriented convertible will likely see an official reveal in the next few months, possibly as soon as the New York Auto Show in April, ultimately finding its way into dealerships just in time for the 2016 model year. Though no official details have been released, we can speculate that the JCW convertible will be similar to the John Cooper Works coupe, which is already in production. The hardtop JCW features black wheel arches, JCW logos, body-colored side skirts, black stripes with Chili Red lines, and a brand new Rebel Green Metallic exterior paint, an exclusive to the JCW line. We would expect most of these features to carry over to the convertible, though only time will tell. Here at MINI of Pittsburgh, we’ll keep you updated with new details as we get them! Eight minutes and twenty-three seconds. That’s how long it took the 2013 MINI John Cooper Works GP to lap the legendary Nürburgring Nordschleife. 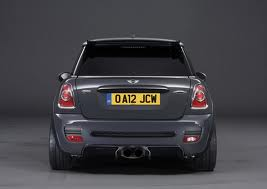 Finishing the lap a significant nineteen seconds ahead of its predecessor, the 2013 JCW GP is the fastest MINI to date. The 2013 MINI John Cooper Works GP, as you can probably guess, is essentially the MINI JCW with more of the fun, spirited driving dynamics that are uniquely MINI. A sporty body kit featuring a rear diffuser, a carbon-fiber wing above the backlight, and new side skirts don this machine. Bright red mirrors and four-spoke wheels are to its one-of-kind appearance. The rear seat has been removed for weight reduction, and the GP is expected to get the same 211 horsepower the JCW Countryman has. As a limited edition, only 2,000 GPs will be built and sold globally, making it a rare addition to anyone’s garage. Watch for the arrival of the MINI John Cooper Works GP, expected to be offered for sale later this year, and don’t miss your chance to own the fastest MINI ever built. MINI and the John Cooper Works Countryman went to great lengths on this video to make something amazing. Watch and enjoy as the John Cooper Works Countryman gets a man airborne and lets him go. Then the fun begins….the Countryman zooms after the human flier to race. MINI had plenty on hand for visitors to the Geneva Motor Show 2012. MINI brought along five new MINI vehicles to show off for their world premiere to guests to the show. The new MINI Clubvan Concept vehicle, MINI John Cooper Works Countryman, and three special models all premiered globally for the first time. The John Cooper Works Countryman definitely is the sportiest of the MINI vehicles The MINI John Cooper Works Countryman has an updated engine that improves the power and efficiency of the vehicle as well as the option to have an automatic transmission for the first time. . Loaded with the ALL4 all-wheel-drive system, it is ready to take on all road and weather conditions thrown its way. MINI also put the new Clubvan Concept on the stage for visitors to enjoy. The new concept vehicle looks to enter in a new segment for business and personal use of a premium small car with extra room. It differs from the Countryman by having only a two-seat layout and a large, flat load compartment with opaque rear windows. The other three models to grace the stage were the MINI Baker Street and Bayswater Olympic editions and the MINI Highgate convertible vehicle. The special Olympic edition MINIs are Hardtop versions with exclusive equipment and special branding. MINI is excited to announce that the MINI John Cooper Works Countryman will be available in the fall of 2012. The John Cooper Works Countryman combines the ultimate sport racing components with all-wheel drive on the Countryman model. Roaring to life with a new four-cylinder turbocharged engine, the John Cooper Works Countryman delivers 211 horsepower to the driver’s fingertips. With MINI’s ALL4 all-wheel drive, the new MINI is ready to take on any terrain or weather element thrown its direction. The John Cooper Works Countryman is the first John Cooper Works model to have an optional six-speed automatic transmission rather than the standard six-speed manual. As drivers turn each corner and maneuver in the new Countryman, the suspension is ready to flow with every movement of the vehicle and give the great agility they are known for. The John Cooper Works Countryman jumps off the line, going 0 to 62 mph in 7.1 seconds and early European fuel economy tests show that it will attain 39.2 mpg. Chassis design on the new Countryman incorporates a front axle with MacPherson struts, central-arm rear axle, Electric Power Steering, and a high-performance braking system. 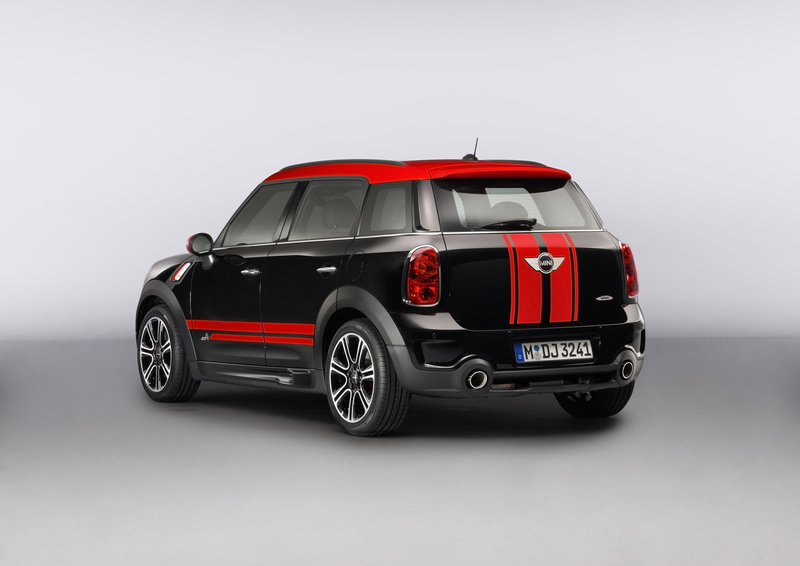 Stay tuned for more information as we approach fall 2012 with the release of the John Cooper Works Countryman.